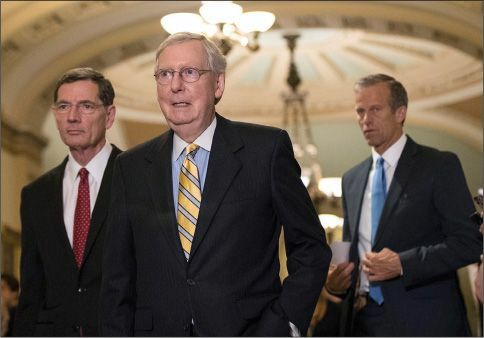 Senate Majority Leader Mitch McConnell this week postponed a vote on a bill to repeal and replace the Affordable Care Act, after a scathing assessment by the nonpartisan Congressional Budget Office left several GOP senators unwilling to back the legislation. Crafted in secret and unveiled last week, the Better Care Reconciliation Act would drastically overhaul Medicaid, rework the tax credit system for the individual health insurance market, and provide massive tax cuts to higher earners. Under the legislation, the Medicaid expansion enacted through Obamacare would be phased out between 2021 and 2024, and federal funding for the program would be reduced, primarily through a cap on how much the government would pay for each recipient. On the individual market, the bill would provide smaller tax credits to people buying policies and reduce the number of people eligible for those credits. Like the American Health Care Act passed by the House in May, the Senate bill would scrap Obamacare’s individual mandate, which imposes fines on Americans who lack health insurance; instead, those who let their coverage lapse for 63 days wouldn’t be allowed to buy insurance for six months. In its analysis, the CBO predicted that 15 million more people would be uninsured next year compared with under the current system, and 22 million more by 2026—similar to estimates for the House’s bill. Average premiums would drop to 20 percent lower than under existing law, but because coverage would include fewer services and have higher deductibles, “few low-income people would purchase any plan,” the CBO warned. A provision allowing insurers to charge older people more would result in much higher premiums: A 64-year-old earning $26,500 would pay $6,500 a year for a midlevel plan, up from $1,700. The average deductible for subsidized plans would rise from about $3,500 to more than $6,000. The Senate bill would reduce federal spending by $321 billion by 2026, compared with $119 billion for the House’s version. “No bill will ever be perfect,” said The Wall Street Journal. But this bill would help repair the “failing” individual insurance market, impose much-needed limits on the ballooning costs of Medicaid, and enact “an enormous pro-growth tax cut.” These are worthy reforms. The GOP “holdouts” blocking its passage need to appreciate that “they may never have a better chance to improve U.S. health care”—and that if they fail, they’ll be severely punished at the ballot box. There are “areas of the Senate bill that should be improved,” said Avik Roy in The New York Times. Low-income enrollees should be given more help to “afford their deductibles.” But the legislation as a whole represents “substantial progress in American health care.” The tax credit system’s focus on age would “encourage younger people to enroll,” which in turn would drive down the cost of premiums for everyone.